Do you like BIG trucks? How about REALLY BIG trucks?? If so... Here is the biggest, baddest truck of them all! 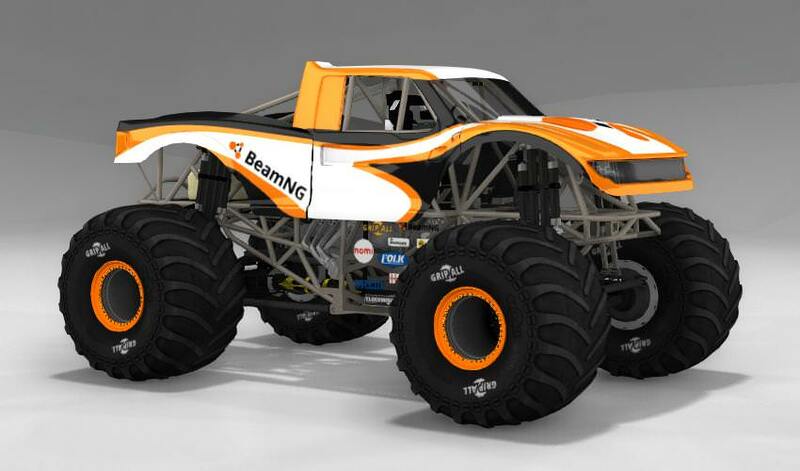 A professionally designed Monster Truck using advanced vehicle technologies drawing inspiration from the Monster Jam™ Monster Trucks you see on TV. Put yourself in the cockpit of this amazing machine and feel the massive horsepower delivered to the 66" tires as you mash the accelerator! Hold on tight, because this Monster Truck is equipped with a large 540ci Methanol-fueled "Big-Block" motor, straddled with a 8:71 Roots type blower - producing an incredible 1500+hp! This Monster Truck is nothing short of high performance with a fully tuneable suspension, engine, transmission, and powertrain. In addition to breakable suspension components, this release also features a completely breakable fiberglass body that will disintegrate on impacts! If you think you are ready for some high-flying, car-crushing, heavy-landing experience, with an extreme sense of satisfaction from the destruction and carnage left behind – this is the mod for you! A continuation of the original CRD Monster Truck project by SealedGecko. - Improved handling and performance. - Completely redesigned JBeam structures. - New Trophy Truck bodystyle (3D model by Andrew Sheets@Sim-Monsters). - New SUV bodystyle (3D model by Klayton Halog@Sim-Monsters). - Interchangeable body shells and paint designs. - Fully breakable body and suspension. - Customisable powertrain and suspension settings. - Engine sounds, engine thermals and fire simulation. - Working RII lights, reverse light, tow hitch, optional rear-mounted flags and back-up beeper. - Optional independent rear steering. If you have any previous version of this mod installed, please uninstall it and remember to clear cache before launching the game! Nicholas Kozak@Sim-Monsters - models for chassis, shafts. Matt Wilkinson@Sim-Monsters - models for axles, knuckles. Andrew Wamsley@Sim-Monsters - models for engine, supercharger, exhaust headers. Klayton Halog@Sim-Monsters - models for transmission, rims, tires. Michael Murray@Sim-Monsters - models for seat, radiators, fuel cell. Ryan McCauley@Sim-Monsters - models for gauges. Chris Hamilton@Sim-Monsters - models for pedals. ROCKGODBOSS - models for steering wheel, rear steering switch, shocks, swaybars, engine supports, radiator hoses, fuel line, various minor details of the chassis. 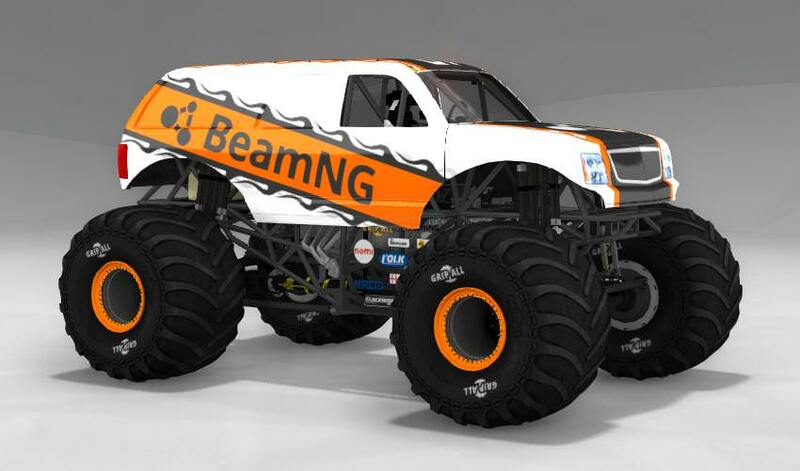 SealedGecko - special thanks for bringing Monster Trucks to BeamNG.drive first, and allowing continuation of his project. Matchbox201 - a good friend... and the best collaborator I could ever hope for! Olrosse - various smart contributions to the JBeam rework. acapaldi, Blijo, jedipresence, Mike Bevavava (in a strict alphabetical order) - exceptional graphic artists. If I've overlooked for credits, please let me know via PM so that I can fix it! All my group members, beta testers and contributors. You may not redistribute nor modify this resource without permission! Eve1Knieve1, YEeye, BNG Monster Jam and 51 others like this. Best mod on beam...HANDS ON!!!!!! You need to install the correct part (Independent Rear Steering) to the vehicle, otherwise default behavior is Linked and specific keys (G, H) are ignored. New Guy here & Former MJ Crew Chief, Appreciate all the hard work everyone is doing or has already done. Been dreaming of realistic game for many years. Thanks to you guys and BeamNG we have it! As a kid in the 90s I used to set-up crashes and and Monster Truck events with matchbox cars in my parents living room while they were out. Sometimes even burning them for realism. Luckily we all survived this fire hazard. Anyway, thanks for making my relive my childhood dreams in safety and more detail this time around. This is pretty much the only reason i got beamng drive. This mod is downright amazing.